This is the kind of free improvisation jazz that can all too easily fall into a kind of caricature of itself, and the extended abstract playing of something like Up Tempo will no doubt deliver in this regard to the kind of listener who has taken their appreciation no further than the ‘Welcome to Jazz Club’ sketches on that 1990’s comedy The Fast Show. What I am always keen to hear with these kinds of recordings is whether the musicians are actually listening to each other and responding and conversing constructively. Give-and-take elements in even the loud and frenetic passages of Up Tempo are always present, with space for solos and duets in a structure that at the very least gives an impression of having had some advance planning. There is a feel of experiment in some tracks, with the sound of the piano reduced to knocks and bumps in Beyond the Sound, the strings resonating under sparing notes from the horn, and the percussion adding antique flavours with what sounds like gently struck woodblocks. The inclusion of a violin implies the potential for more sensitive reflection, and Jennifer Choi creates a genuinely soulful feeling in the all too brief track Romance. Many of these tracks are indeed quite short: a couple of minutes often enough to place a clear statement or atmosphere, without lingering too long and loosing structure and intensity to aimless noodling. Improvisation work can be all too easily ruined by insensitive percussion, but Susie Ibarra’s contributions are always right on the mark. She has a wide pallet of colours and timbres, demonstrated in the soft stick cymbals that garland the piano playing in Premonition, but she can underpin and drive rhythm with the best of them. Autumn Whispers is another track in which subtle strokes on gongs, cymbals and chimes shapes silence rather than imposing an egotistical musical message. Graham Haynes’ horns are refined in both sound and musical content, giving at times a human or animalistic voice to tracks like the miniature Fireworks, but also soaring at times with melodic expressiveness, as in the impressionistic Floating on a Breeze, a duet with Fujiyama. The programme is well curated, with this kind of intimate moment lifting off in the next track with the same instruments into something that opens out into different colours. 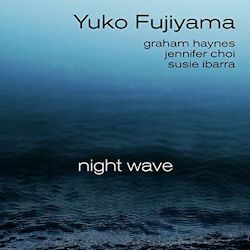 All in all this is a highly successful recording, with four musicians that are palpably in sympathy with Yuko Fujiyama’s vision, but strong enough in their own right to play equal parts in a vibrant playground of creative music making. There are little poetic texts given to each track in the foldout sleeve as a descriptive clue to what’s going on in each, but the music always tells its own story and you can allow your associations free rein. For myself, the slow and reflective tracks work best, but that’s more my taste for the melancholy speaking than any qualitative value as to the other music. If you’re intrigued by well-conceived and sublimely executed improvisations then this is a fine place to visit.